Sunday December 26th 1909 It was a cold day. I washed most of the forenoon getting my chickens ready for tomorrow night. After dinner Hatt & Allie came out. They would not stay till after supper. In the evening I made two dishes of fruit salad and my yeast. Will was most of the day [shoveling?] our snow paths and Laura read and rested. When I was at liberty she visited with me Fannie had a fall on the church steps today and will not be able to come out here tomorrow night. 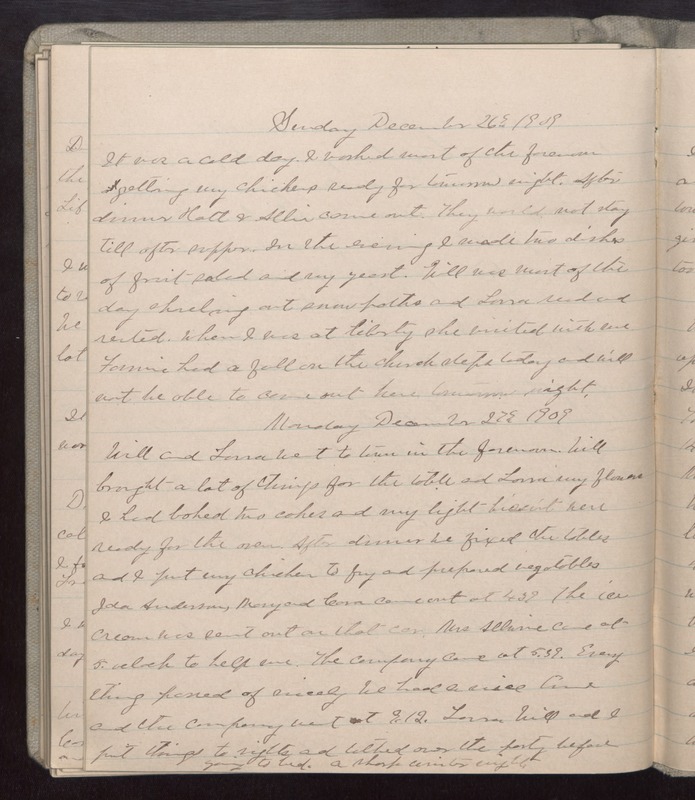 Monday December 27th 1909 Will and Laura went to town in the forenoon. Will brought a lot of things for the table and Laura my flowers I had baked two cakes and my light biscuit were ready for the oven. After dinner we fixed the tables and I put my chicken to fry and prepared vegetables Ida Anderson, Mary and Cora came out at 439 The ice cream was sent out on that car. Mrs [Alluire?] came at 5 oclock to help me. The company came at 5.39. Every thing [illegible] of nicely We had a nice time and the company went at 9.12. Laura Will and I put things to rights and talked over the party before going to bed. A sharp winter night.